SALEM — How much power is there in art? Is there enough to make the rest of the world see The Point the way Ruben Ubiera does? Perhaps that’s setting the bar too high. Few people could love this tight neighborhood of brick apartment buildings, jammed between Lafayette Street and the water on the edge of Salem’s downtown, as much as Ubiera, who grew up here. To the unfamiliar eye, The Point — El Punto — might seem pretty unlovely. Despite the best efforts of the city and community groups, absentee landlords do here what they do everywhere: Rent to poor people for whom they have no respect, collecting their checks while letting grass grow tall and buildings decay. But Ubiera and others want you to look closer -- beyond the reports of drug activity and other crime, the trash on the sidewalks, the fears of those in this historic town who avoid these streets. They want you to see The Point for what it is: A home for mostly Dominican immigrants trying to give their families more, just as it was for the generations of French Canadian immigrants who came here before them. When it comes to The Point neighborhood, Ruben Ubiera wants you to look closer. 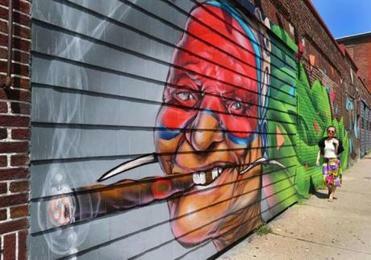 To help you see this, Ubiera and other prominent street artists are filling the walls of this neighborhood with beautiful murals designed to draw you in, leading you down streets you might otherwise have avoided. Their hope is to convince you that the beauty you see outside those buildings can be found inside them, too. It’s all part of a massive project run by the North Shore Community Development Coalition, the affordable housing nonprofit that owns about 40 buildings in the neighborhood. By fall, dozens of muralists will have adorned the walls on those buildings -- and many others - with at least 50 works of art. Organizers are hoping the The Point will be as integral a part of Salem’s cultural offerings as The House of the Seven Gables. Ruben Ubiera is part of a group of artists painting works on the outside of buildings in his childhood neighborhood. One hot afternoon last week, Ubiera — tall, and loudly expansive — stood on a corner at Mary Jane Lee Park, a couple of blocks from where he once lived. The park was jammed with kids, climbing a play structure, squealing as they raced through the fountains at a brand new splash pad. Even though he loved it here, and found plenty of support from family and friends, he remembers feeling cut off from the rest of Salem. Thanks to a tireless art teacher at Salem High, who helped him apply for scholarships, Ubiera went to art school in Florida. He left the corporate world after more than a decade of unfulfilling work as a creative director. He devoted himself to art full-time, falling in with the artists who transformed Miami neighborhood Wynwood into an open-air museum of street art. 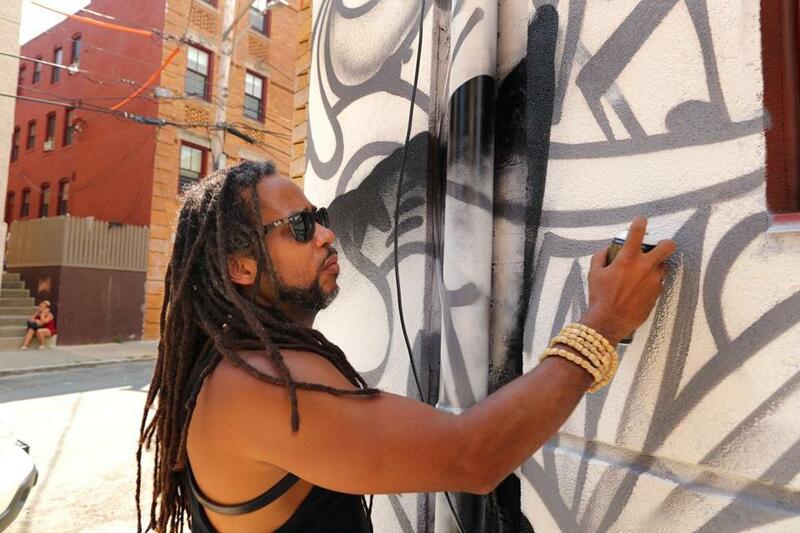 He’s now part of an internationally-recognized group of artists whose work straddles the worlds of graffiti and fine art. He’s back in Salem — towing a band of other prominent, mostly Latino artists, working for a fraction of their usual fees — not just because of his history in the neighborhood, but also because of his personal connection to the North Shore CDC: His sister Rosario works there. Already, The Point is transforming. Ubiera has covered the side of one apartment building with a stylized campesino, an aged farmer’s black-and-white portrait floating in a colorful sea of Dominican artifacts: a mortar and pestle for making sofrito, dominoes, an accordion, plantains, a machete for cutting sugar cane, a carnival mask. 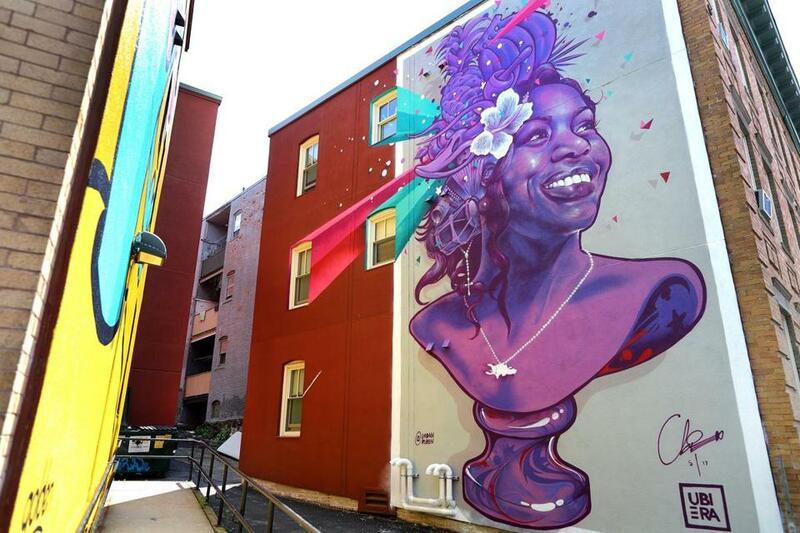 Around the corner, his portrait of Anacaona — a medieval queen of Hispaniola — with his sister’s face, looks out from the neighborhood towards Derby Street. Across an alley, artist Golden, whose spare, joyful art bursts with color, has painted a whimsical worm. His Our Lady Of Guadalupe adorns another building on the other side of Lafayette Street. Further up the street are pieces by other well-known artists: a mesmerizing spiral by Hox, and a witty portrait of a masked Salvador Dali by Sipros. About 20 emerging local artists will also contribute works. This is happening elsewhere, too. In Lynn, another place with an image problem a few minutes down Route 1A, a different army of artists is painting the walls of a gentrifying downtown. But what sets the Salem project apart is its scale, and the determination that the neighborhood remain one that belongs to the people who have lived here all along. Though organizers are hoping the works draw visitors, the art is primarily about the residents. Ubiera and other artists saw how quickly Wynwood gentrified after they helped make its streets into an open-air museum. They don’t want that to happen here. “It was important to us that people are not going to be pushed out of here,” Ubiera said. Such worries might seem like a luxury when it comes to The Point. But gentrification can happen quickly, and in unexpected places. Still, since the North Shore CDC owns so many of the buildings here, The Point is likely to remain affordable for a long time. Ubiera’s mural adorned the side of an apartment building on Peabody Street.